Adoption is a great way to help the animals. Some animals can potentially go back to the wild, but there are many reasons why this is not possible for some of them. If you want to help one of the animals we have listed below, please know that you can adopt one of them starting from 10 euro’s / dollar a month (and of course, there is no maximum). This money will be benefitting your adopted animal for food, enrichment, medicine and a small budget for the maintenance of the enclosure. Of course you will receive an official adoption certificate as you are the caring foster. Black was found in an illegal Zoo, back in 2014. He was clearly mistreated, very skinny and full of scabies. This was so itching, that he had no nails left due to the scratching. 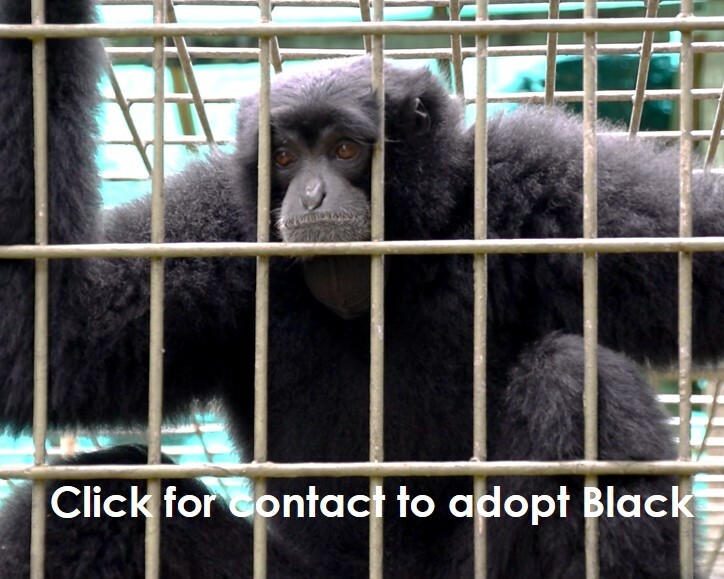 Here in Cikananga he fully recovered and is now in the primate block, singing loudly like only a Siamang can. But considering his canines (teeth) were cut at the illegal zoo, we are providing life-time-care because a return to the wild is not possible: He simply cannot survive in his natural habitat because he cannot eat the food there. If you want help Black by giving the best care, please donate. He will be grateful! James is a very special character and even though he has serious mental problems; he is also a great character. His mental problems were caused by the horrible situation he was living in, on a garbage dump where he was fed cigarettes and beer, was bullied by his owner and many others while he was on a very short chain for years. After being rescued he had a difficult time in Cikananga. The trauma and stress caused self-biting and he used to hit himself on his head. Luckily, he has found more rest in his enclosure after many months. Now he is clearly enjoying himself and much more relaxed, in one of the more silent parts of the primate block. 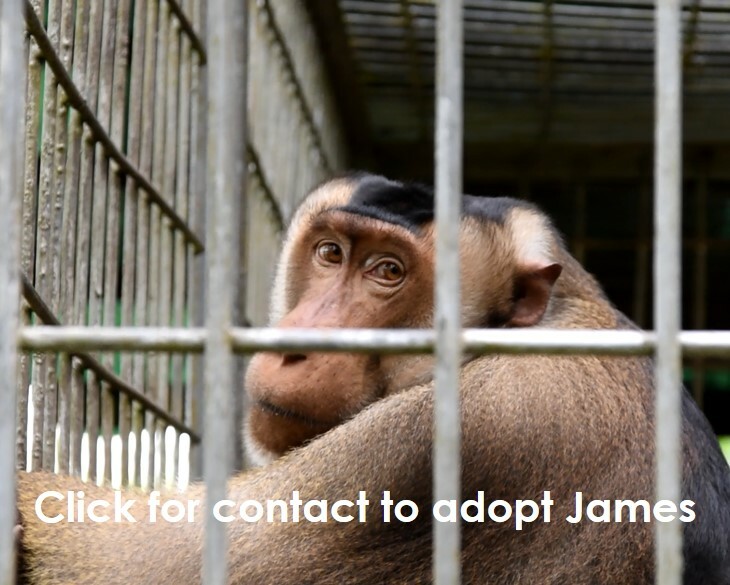 With your help James can life a decent life that he very much deserves. Do you want to adopt James? 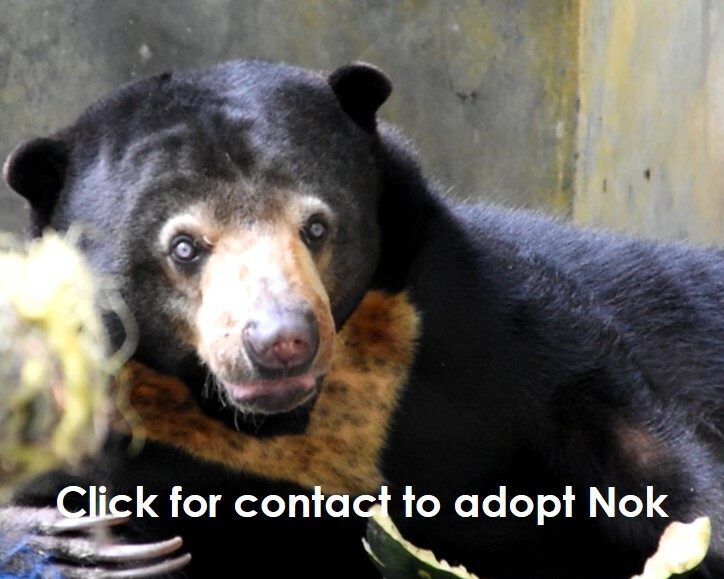 Nok was a pet bear, living with people at home. Although she is has a very friendly character, you can imagine that especially after growing up, a full grown bear is not even remotely a good house pet. After confiscation she came to Cikananga, but her wild instincts diminished while living with a human family that a life in the wild is simply impossible. Now she is living with another Sun Bear and they are spending their days in a nice enclosure with the right food and extraction in the form of very frequent enrichment. Please let us know if you want to adopt her, so we can make the live of Nok a little bit brighter.